Every family has their staple recipes. The recipes which get passed down from generation to generation and are always asked for when the question comes up of "what should I bring?" My Mum's Creamy Potato Salad is one of those recipes. My Uncle could eat a bucket of it, it appears on the table every Christmas time and is a frequent addition at barbeques. Truth be known? I'm not a fan - at all. You see, I hate mayonnaise and I always have. It tastes too eggy, too icky, too ugh. 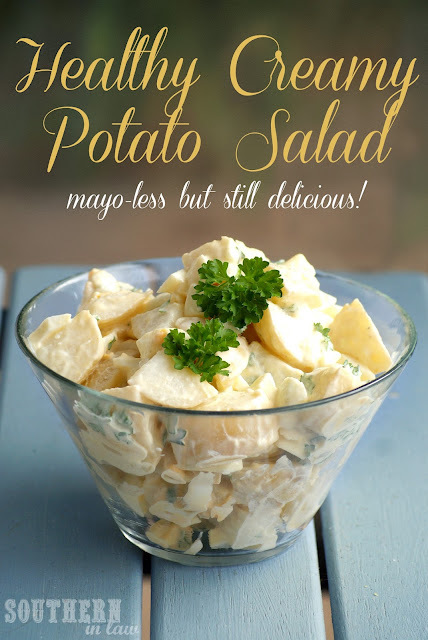 The potato salad was always that dish I avoided like the plague because it was mayo-central. 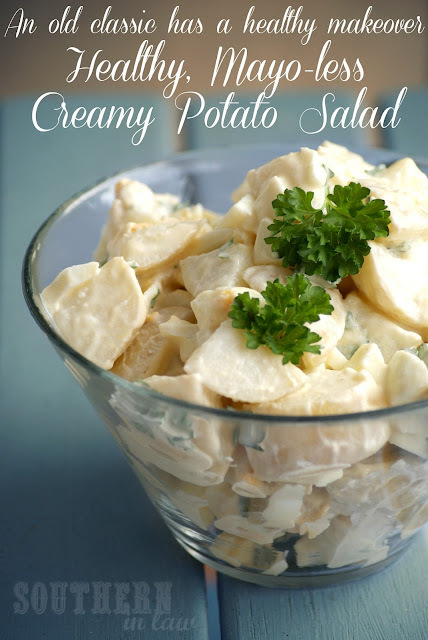 So when I wanted to create a healthy creamy potato salad, guess what went first? The mayonnaise - and I promise you're not going to miss it. This potato salad is really good - and everyone liked it (even the yogurt haters - because they didn't know it was yogurt!). Best of all, it's so so simple. Boil your potatoes until tender. Drain and run under cold water to cool. Gently mix your lemon juice with your potatoes and place into the fridge to cool in a mixing bowl. Mix your yogurt, mustard, parsley and garlic salt in a bowl until combined (and eggs if using). Mix your yogurt mixture through your potatoes, stirring until all potatoes are coated. Pour your potato salad into a serving bowl and serve immediately - or place into the fridge until ready to serve. So tell me, what's your family's staple recipe? and are you a mayo fan? Definitely! It's the perfect summer salad! I didn't grow up with potato salad, but we usually had coleslaw. I didn't like the mayo in that dressing, so I started using Greek yogurt instead about 4 years ago. Nobody has figured out my secret yet! Ahhh! Yes it could definitely work with coleslaw too! If you don't tell people, they don't have any preconceived ideas. I never tell anyone my chocolate cake is a healthy one - but they rave about it and ask me for the recipe and when I tell them it's on the blog they're like "NO WAY?! IT'S HEALTHY?!" Jesse even calls my "Secretly Healthy Double Chocolate Brownies" the "Ican'tbelieveit'snotfattening chocolate cake"
Hello....I read your potato salad recipe with interest. I am pro-mayo, but the use of yogurt instead is tempting, however, just the smell of greek yogurt (chobani and oikos)makes me nauseous. I don't know why. I can smell it from across the room. My husband loves it and has started washing out the cup before he throws it away because I'll be able to smell it and I find it offensive. Weird, huh? So, I'll continue with mayo but your recipe did look good and is a healthy alternative. You can also use plain yogurt if that is more appealing? Sounds delicious! Can't wait to try it. How many eggs would you use for this recipe? I'd probably say about 4-6 eggs - depending on how much egg you like in your potato salad! We usually boil up a dozen and use however many we need and save the rest for snacks/lunches etc.